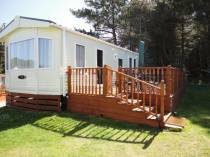 SITED AT TRENANCE HOLIDAY PARK, NEWQUAY, CORNWALL. The caravan is privately owned and cleaned. It is well sited on a cut grass area with free parking by the side. There is outdoor seating and table. Please note that the Site only allows couples and families and does not allow pets. There is a No Smoking Policy inside the accommodation. There are two bedrooms - one double with radio alarm and Freeview, colour TV and one twin. A further double can be made up in the lounge. All beds are provided with pillows and duvets. Bed linen is only provided for one double bed. The bathroom has shower cubicle, toilet and handbasin. The Kitchen is well equipped for up to 6 people and has a gas cooker, microwave, fridge, toaster, iron and board.